Possibly the greatest joy of being part of franchising is the opportunity to meet and become friends with some of its legends. With likely very few exceptions, Bill Rosenberg may have had the most lasting impact on franchising, and his impact is still being felt today more than a decade since he passed. Bill Rosenberg was a product of the depression, born in 1916 in Dorchester, Massachusetts. With an eighth-grade education he left school to help support his family, worked in his father’s grocery, and legend has it that as a boy he transported a block of ice to a New Hampshire racetrack and sold ice chips for 10 cents each, earning himself $171.00 in a single day. At the age of 17, he landed a job driving an ice cream truck and, because of his entrepreneurial skills, was promoted to management by the time he was 20. 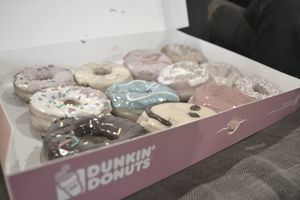 The origins of Dunkin’ Donuts go back to World War II when Bill worked at the Quincy Shipyards and realized that the workers at the shipyard had few options available to them for lunch. Following the war in 1948 he purchased some used telephone company trucks, converted them to mobile food canteens, and began to service industrial sites with sandwiches, coffee, donuts, and snacks. With about half of his sales coming from coffee and donuts, in 1948 Bill decided to open a restaurant in Quincy called "Open Kettle" that sold coffee for ten cents and donuts for a nickel – an outrageous price for the times. While the shop was quickly a success and grossing over $5,000 per week, Bill was not happy with the name and, noticing that customers dunked their donuts in their coffee, the Open Kettle was renamed "Dunkin’ Donuts" in 1950. Before long there were Dunkin’ Donuts restaurants in Somerville, Natick, Saugus, and Shrewsbury where customers could watch as the bakers made the donuts. Bill credited Howard Johnson and his chain of franchised ice cream stores with giving him the idea to franchise Dunkin’ Donuts. In 1955 the first franchised Dunkin’ Donuts was opened in Dedham, Massachusetts, selling 52 varieties of donuts, enough to have a different special each week of the year. By 1963 the company had opened its 100th restaurant and grew to over 1,000 locations by the 1970s. Today there are over 11,300 locations operating worldwide with 3,200 international restaurants in 36 countries. Dunkin’ Donuts is sometimes co-branded with Baskin-Robbins, the other brand franchised by parent Dunkin’ Brand, Inc. In 1963 Bill’s son Robert, then 25 and a Harvard Business School graduate, took over the management of the chain that he led until 1999. Under Robert’s leadership the company changed, streamlined its menu offerings, moved to paper and Styrofoam cups, and introduced muffins, bagels, donut holes (Munchkins), croissants, breakfast sandwiches, Coolattas and other beverages. Robert introduced a national advertising program, changed the format of the stores by moving away from counters with stools to tables, and began to offer Dunkin’ Donuts at non-traditional locations. He also began to sell franchises to multi-unit operators, introduced satellite locations and later a commissary system, each of which helped fuel growth by eliminating the need for buildings large enough to house donut manufacturing and finishing. I met Bill at my very first International Franchise Association convention. I was young, unknown, and totally full of myself. Unquestionably I was someone who a person of Bill’s stature could have easily ignored. What I remember most about our first meeting was that he came up to me and introduced himself. I was new to the IFA and Bill, as was his nature, wanted me to feel like I belonged. He then spent the next hour or so calling out to others he saw and introducing me to them. Over the years that followed he taught me, and everyone around him, how to be an effective franchisor. That was his nature. I was not the first or the last person who had exactly the same experience, and while it may seem difficult to imagine if you have not experienced it, that is how most new members to the IFA are greeted today. There was nothing subtle about Bill. He could be gruff; demanded excellence, though never demanded acquiescence to his ideas; enjoyed debate; took pleasure in the challenge of new ideas, and even more so in telling you when you were wrong (you usually were). His language was more than a bit colorful, and his time was always yours when you asked for it. Many people think of themselves as mentors, but I don't think anyone in franchising ever could have asked for a better mentor than Bill - and he mentored everyone. All you had to do was ask him a question, and his time–even late into the evening–was yours. That was his nature. Rosenberg's greatest commercial achievement was clearly Dunkin’ Donuts. That is a legacy brand that would be enough for anyone to create in one lifetime. But it was his work in founding and molding the International Franchise Association where I think his greatest impact is still being felt. In addition to establishing the culture that still exists within the IFA today, Bill was committed to making sure that the franchise model would improve through the experiences of franchisors and franchisees. To accomplish this goal he spearheaded the establishment of the International Franchise Association’s Education Foundation in the 1980s. In addition to courses developed for its members, the foundation today has a course of studies that, when completed, bestows a Certified Franchise Executive certification, and is the principal source of continuing research and education for franchising on a global basis. Great organizations are built on the culture of their founders. To experience the International Franchise Association is like meeting Bill Rosenberg. In 1959, together with about a dozen franchisors meeting over a coffee table in a kitchen in Chicago, Bill challenged the others to each invest $100, and the IFA was established in 1960. At the time franchising was being tarnished by bad practices and a host of scams; litigation was growing, and so were legislative actions to rein in the problems. Working with legislators, the IFA was able to assist in crafting laws that benefited both franchisors and franchisees and, through those efforts, cleaned up the problems in franchising and molded franchising into what it is today. Bill also imprinted into the DNA of the association his caring about others, and new members of the association always comment on how different the IFA is from other associations they have been members of. Today franchising is used in over 120 different industries, and the IFA continues in its efforts to improve the performance of franchising for both franchisors and franchisees. In his later life, Bill Rosenberg became involved in harness racing and opened Wilrose Farm in New Hampshire that he donated in 1980 to the University of New Hampshire. In 1994 the university sold Wilrose Farm and endowed the William Rosenberg Chair in Franchising and Entrepreneurship, the first such faculty position in the university world. I currently serve with several others in franchising on the advisory board at the Rosenberg International Franchise Center at the University of New Hampshire. Bill died of bladder cancer on September 20, 2002, at the age of 86. Many thanks to his wife Annie Rosenberg; Arthur Anastos, Vice President and Managing Counsel at Dunkin' Brands; and John Reynolds, President of the International Franchise Association Education Foundation; three people very important to Bill, for their assistance and contribution to this article.